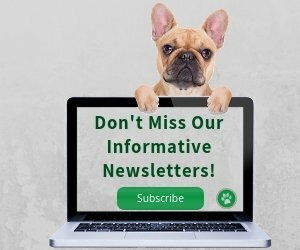 If you have dogs (and/or cats! ), then controlling fleas can be a year-round challenge, especially if you live in a place where it is warm and humid most of the year. Fleas flourish in warm and humid environments (65-80°F; with humidity in the upper 70% range or higher). The flea is an intermediate host of tapeworms, so if a dog ingests a flea infected with tapeworm eggs, the dog will get infected by tapeworms. Some dogs also develop fleabite allergies. It is therefore important to make sure that your household environments (both inside and outside) are flea-free! There is a host of flea control products (e.g. flea powder, flea bombs, dips, and flea collars) that can be found on the market. However, we know as a fact that these chemical laden flea products are toxic and harmful to our pets. 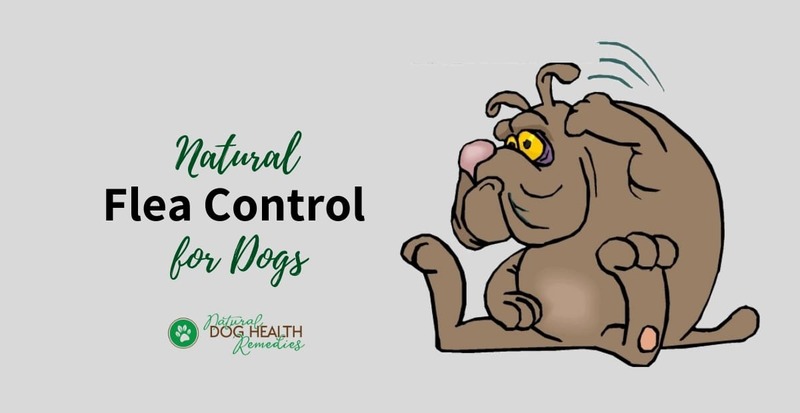 These products can cause health issues in dogs, such as skin irritations and inflammations, hair loss, autoimmune diseases, digestive disorders, nervous disorders, and various kinds of cancer. So, what's the alternative? Natural flea control? Does it work? You may wonder. The answer is a reassuring "yes", although it takes more time and work on your part. Let's look at how to get rid of fleas naturally. Many people are unaware that flea combs are an excellent tool to trap and get rid of fleas on dogs. If your dog has fleas, put him in the bathroom and comb his fur thoroughly from head to tail several times before giving him a bath. After the bath, comb the dog one more time to make sure that all fleas are trapped and gone. ACV can help repel fleas on dogs. You can dilute apple cider vinegar in water (50:50) and use that as an after-shampoo rinse. You can also prepare a spray by using 50% ACV and 50% water. Use a spray bottle and spray your dog's fur before his daily walks (avoid the eyes, nose, and mouth), and use it to spray his bedding as well. Note: If you have a dog with light-colored hair, ACV will stain the dog's coat. Neem has strong insect repelling functions and can be used effectively to repel fleas, mosquitoes, and ticks. Squeeze some natural doggie shampoo out into a smaller container and add 2-3 drops of pure neem oil. Mix well. Use the shampoo to wash your dog. Mix only as much as you need to wash your dog because neem oil could be unstable when mixed with other substances. 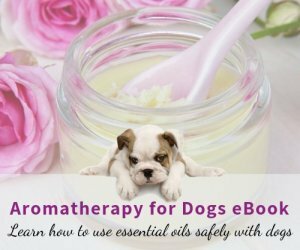 Also, you can add 2 drops of neem oil to a tablespoon of coconut oil, and dap this mixture strategically on your dog (the "armpits", the nape of the neck, the back, the tail area, tummy, etc.) before going out for walks. Mix the herbs together and store them in a jar, preferbably with a shaker top. Use the herb mixture topically on your dog's coat 2-3 times per week. While these herbs cannot kill fleas, they can nonetheless repel them. 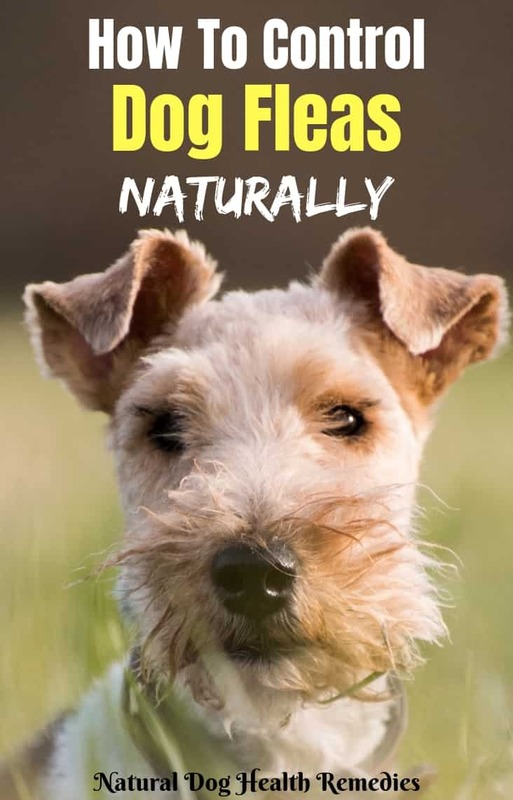 Therefore it is advisable to let your dog outside after applying this herbal flea powder so that the fleas will not jump from your dog to you or your furniture in the house. As always, be sure to use 100% natural pure essential oils. This formula was developed by S. Catty (author of Hydrosols: The Next Aromatherapy), and I found it easy to make and effective. Combine the essential oils. Use 12-15 drops of this essential oil blend per cup of baking soda. Shake to mix well. If your dog has fleas, put this flea powder on the dog and, after vacuuming, sprinkle it on furniture, floors, carpets, your dog's bedding, and places where you think fleas might hide. Let the powder stand for 30-60 minutes, then vacuum again. Do this once a week. Finally, this essential oil collar is an easy natural flea control that can repel not only fleas but also mosquitoes. Dilute the oils in half an ounce (15 ml) of base oil. Add a few drops of the oil mixture to your pet's bandanna or a cotton collar, seal it in an airtight plastic bag and leave overnight, and voila, you have made a natural, safe, and nice-smelling flea collar for your four-legged friend! Note that the oils will not kill the fleas, but since the smell repels them, a herbal flea collar will stop the fleas from camping out in your dog's fur. How About Dawn Dish Soap and Vinegar? A lot of people swear by Dawn dish soap and vinegar and use it as a flea control "shampoo" for their dogs. According to the Environmental Working Group (EWG), Dawn contains the chemical methylisothiazolinone, which may cause skin irritation and allergies, asthma and respiratory issues, and is not eco-friendly. So... Dawn dish soap and vinegar may kill fleas, but at the same time it may pose some health risks to your dog as well! Understand that as in many health problems, strong adverse reaction to fleas and flea bites, i.e. flea allergies, is indicative of a poor immune system. Dogs with a strong immune system usually are less bothered by a few flea bites here and there. Those with a weakened immune system, on the other hand, may develop severe allergy symptoms just from one or two flea bites. 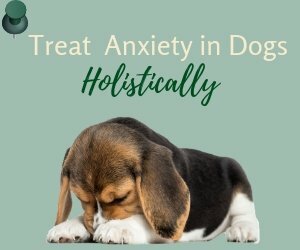 It makes sense, therefore, that if we want to fight a winning battle against the lowly fleas, we have to build up our dog's health and resistance through a healthy natural diet and lifestyle, aided by natural supplements. Echinacea, St.-John's Wort, Astragalus - These herbs are excellent in boosting the immune system. Burdock root, Dandelion, Red Clover - These herbs help eliminate wastes and also strengthen the body's natural defense systems to cope with fleabites. Nettle - The antihistamine action may reduce allergic reaction to fleabites. Instead of resorting to harsh, harmful chemicals, we can also use other natural flea control methods that are safe and environmentally friendly ways to get rid of all the unwelcomed "bed and breakfast backpackers" on our pets. Since about 95% of the flea's life cycle exists in the environment, it is extremely important to constantly clean our living environment. The longest stage of the flea life cycle is the egg. Eggs are resilient and can remain dormant in the living environment for months. They tend to be found in cracks and crevices, in the carpets, etc. Therefore, cleaning and vacuuming regularly will interrupt the flea life cycle. If there is a flea infestation in your household, you need to steam clean the carpets to kill off the eggs. Also, regularly vacuum and clean the floors to make sure that the eggs as well as the larvae and pupae are eliminated. In a recent study, it has been found that vacuuming kills fleas in all stages of their lives, with an average of 96% success in adult fleas and 100% destruction of fleas in other stages (eggs, larvae, pupae). When vacuuming and cleaning, pay particular attention to the surrounding area where the dog sleeps. The dog's bedding should also be washed once or twice a week with hot soapy water. DE is actually the fossilized remains of some prehistoric planktons. The fine particles in the earth cut through the exoskeletons of insects when they walk on it (kind of like people walking on broken glass - ouch! ), resulting in dehydration and the insects will usually die in a few hours. If you want to try using DE, be sure to get the unrefined type (not the type used for swimming pool filters). Wear a mask (especially if you have a sensitive nose!) when you sprinkle the earth along the walls, under the furniture, and places where your vacuum cleaner cannot reach. You can do it once or twice a year to make sure that some bugs on the loose hiding out in some cracks and crevices in your house are "properly dealt with". Don't Want To Concoct Your Own Flea Remedies? Visit this page for suggestions of some natural flea and tick control products.